Temperament: Siberian Huskies are loving, gentle, alert, outgoing, playful dogs. They are very intelligent and can get bored easily. They do not do well when left alone for long periods unless exercised beforehand. They are not well suited for guard dogs as they are generally very accepting of strangers but may be slightly reserved. They make great sled and working dogs. Family Dog: The Siberian Husky is a great family dog. They do well with children and are friendly with strangers. They are good with other pets if they are raised with them from a young age. Shedding: The coat of the Siberian Husky sheds heavily twice a year. Grooming: The coat of the Siberian Husky should not be trimmed except for the whiskers and fur between the toes. Barking: The Siberian Husky does not make a good watchdog as they bark very little but they do like to howl and give other vocal expressions. Weather: The Siberian Husky does best in cool climates but can do fine anywhere provided they are given access to air conditioning during the warmer months. The Siberian Husky is built to withstand extreme temperatures as low as -76 degrees F (-60 degrees C). 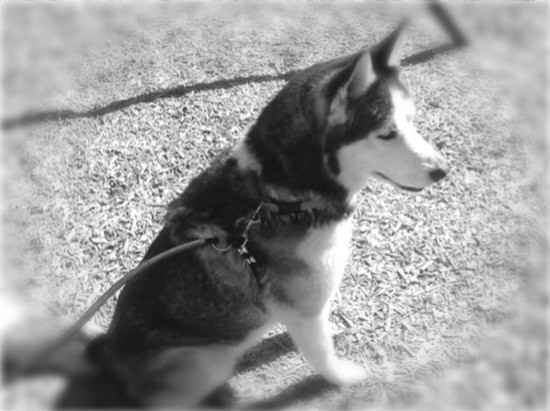 Exercise: The Siberian Husky needs a good amount of daily exercise, including a long walk or jog. They should not be exercised too much in the warm weather. Living Conditions: Siberian Huskies are not recommended for apartment living. They can live in an apartment provided they are given plenty of daily exercise. They do best with a large fenced yard but be careful because they like to dig underneath them. Appearance: The Siberian Husky has the appearance of a moderately compact, medium-sized working dog with erect ears and a furry tail. They are graceful and light on their feet. Size: The male Siberian Husky stands between 21 to 23½ inches tall and weighs between 45 to 60 pounds. The female ranges from 20 to 22 inches with an average weight of 35 to 50 pounds. Head: The head of the Siberian Husky is medium sized and in proportion with the body. The top is slightly rounded and tapers from the broadest point to the eyes. The stop is well-defined with the bridge of the nose being straight from the stop to the tip. Siberian Huskies have a friendly, interested look. Nose: The nose of the Siberian Husky is black in black, gray or tan dogs, liver in copper colored dogs and flesh-colored in pure white dogs. Eyes: The eyes of the Siberian Husky are almond shaped, moderately spaced apart and set a trifle obliquely. They may be blue or brown in color or one of each. Ears: The Ears of the Siberian Husky are thick, well-coated, medium in size and triangular in shape with a slightly arched back and held strongly erect. They are close to and set high on the head. Muzzle: The muzzle of the Siberian Husky is medium in length with its length being half the overall length of the skull. The muzzle is medium in width and tapers gradually toward the nose with a neither pointed nor square tip. The lips are close fitting. Teeth/Bite: The teeth of the Siberian Husky meet in a scissors bite. Neck: The neck of the Siberian Husky is of medium length, arched and carried erect with the dog is still and held slightly forward when the dog is in motion. Body: The overall length of the body is slightly longer than the height of the body. The chest is deep and strong, but not too broad extending to the elbows. The ribs are well-sprung but flat on the sides to give freedom of motion. The back is straight and strong with a level topline. Forequarters: The muscular shoulders are well laid back with the upper arm angling slightly backward from the point of shoulder to the elbow. When viewed from the front, the legs are set moderately apart and are straight and parallel with the elbows close to the body and turned neither in nor out. When viewed from the side the pasterns are slanted but flexible. The lower portion of the leg is slightly longer than the upper portion. Hindquarters: When seen from the rear, the hind legs are set moderately apart and parallel to each other with the muscular, powerful upper thighs. The stifles are well bent. The hock joint is well-defined and set low to the ground. Gait: The Siberian Husky has a smooth and effortless gait. They are quick and light on their feet with good forward reach and a strong rear drive. As the dog's speed increases all four legs gradually slant inward until they fall in line directly under body. The topline should remain firm and level while the dog is in motion. Feet: The Feet of the Siberian Husky are medium sized, compact and oval in shape. The pads are thick and tough with lots of fur between the toes. The paws should turn neither in nor out. The dewclaws may be removed. Tail: The Siberian Husky has a well furred, fox-brush tail that is set just below the topline. It is usually carried over the back in a sickle curve when the dog is at attention. The tail should not curl to either side nor lay flat against the back. The tail is usually down when the dog is in repose. The tail is covered in a medium length coat that is the same length on all sides. Color: The coat of the Siberian Husky can be any color from pure white to pure black with a variety of markings on the head and body. The most common coat colors are black and white, red and white, gray and white, sable and white, silver, brown, wolf gray or red-orange with black tips. Coat: The Siberian Husky has a medium length, double coat giving them a well-furred appearance. The undercoat is soft and dense with the guard hairs from the outer coat lying smoothly over it. The lack of an undercoat during the shedding season is normal. Life Expectancy: The average life expectancy of the Siberian Husky is between 12 to 15 years. Health: The Siberian Husky is prone to hip dysplasia, ectopy, PRA, corneal dystrophy and eye issues. Skin Health: The Siberian Husky is prone to Zinc Responsive Dermatitis which can be improved by giving a zinc supplement. History: The Siberian Husky was originally used by the Chukchi Tribe, off the eastern Siberian peninsula to pull sleds and herd reindeer. They were brought to Alaska by fur traders in Malamute and used in arctic races because of their speed. In 1908, Siberian Huskies were first used for the All-Alaskan Sweepstakes which is an event where mushers drive their dogs on a 408 mile long race. In 1925, during a diphtheria epidemic in Alaska, Siberian Huskies were used to transport medicine the sick. This breed was first recognized by the AKC in 1930.